﻿At the 20th Anniversary Celebration for Ultima Online, Richard Garriott and Starr Long presented lots of information about the history of UO. 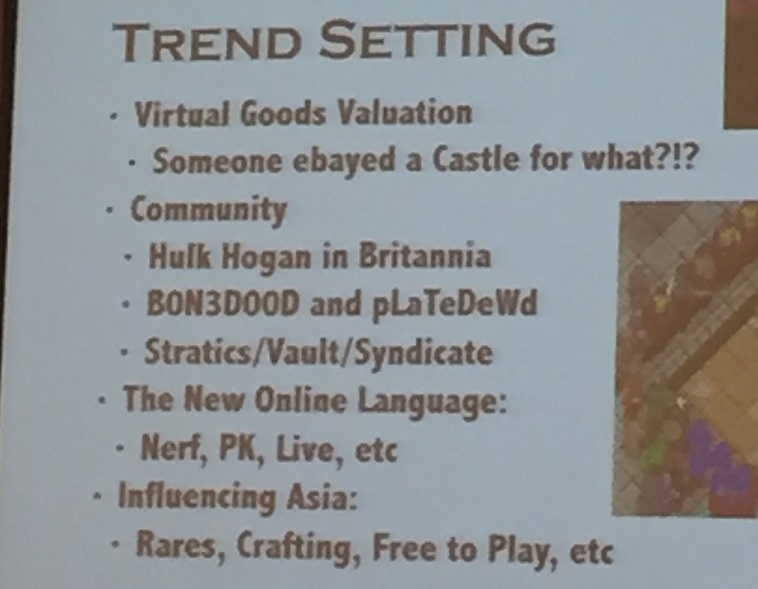 One of the things that was discussed was some of the 'things' UO created from terminology to gaming ideas etc.. And one of those 'things' was The Syndicate came to be in the pre-alpha of UO. We went on to define what a successful online community looks like; set the Guinness World Record for longest, continuously operating online community; have two books about us; be featured in several movies and documentaries and have dozens of articles published on us. In the context of this discussion we were framed up as trend setting. And with tens of millions of guilds rising and falling in our nearly 22 years of existence, that certainly seems an apt description. This same slideshow has been presented at numerous gaming conventions and is on deck to be presented again in the spring.